Due to the large eccentricity (0.54) of the 190 day solar orbit, at perihelion Helios 2 was able to reach a maximum velocity of over 240,000 km/hr (150,000 miles/hr). This orbital speed was attained by the gravitational pull of the Sun alone. Technically, the Helios 2 perihelion velocity was not a gravitational slingshot, it was a maximum orbital velocity, but it still holds the record for being the fastest man-made object regardless. And in 2010, Prof. Juan Yang of the Northwestern Polytechnical University in Xi’an, China, began publishing a series of papers about her research into EM Drive technology. This culminated in her 2012 paper where she reported higher input power (2.5kW) and tested thrust (720mN) levels. In 2014, she further reported extensive tests involving internal temperature measurements with embedded thermocouples, which seemed to confirm that the system worked. But adjusted for a one-way journey to Proxima Centauri, a nuclear rocket would still take centuries to accelerate to the point where it was flying a fraction of the speed of light. It would then require several decades of travel time, followed by many more centuries of deceleration before reaching it destination. All told, were still talking about 1000 years before it reaches its destination. Good for interplanetary missions, not so good for interstellar ones. Another possibility within the realm of harnessed nuclear power involves rockets that rely on thermonuclear reactions to generate thrust. For this concept, energy is created when pellets of a deuterium/helium-3 mix are ignited in a reaction chamber by inertial confinement using electron beams (similar to what is done at the National Ignition Facility in California). This fusion reactor would detonate 250 pellets per second to create high-energy plasma, which would then be directed by a magnetic nozzle to create thrust. For example, between 1973 and 1978, the British Interplanetary Society conducted feasibility study known as Project Daedalus. Relying on current knowledge of fusion technology and existing methods, the study called for the creation of a two-stage unmanned scientific probe making a trip to Barnard’s Star (5.9 light years from Earth) in a single lifetime. For instance, there is the fact that helium-3 is scare on Earth, which means it would have to be mined elsewhere (most likely on the Moon). 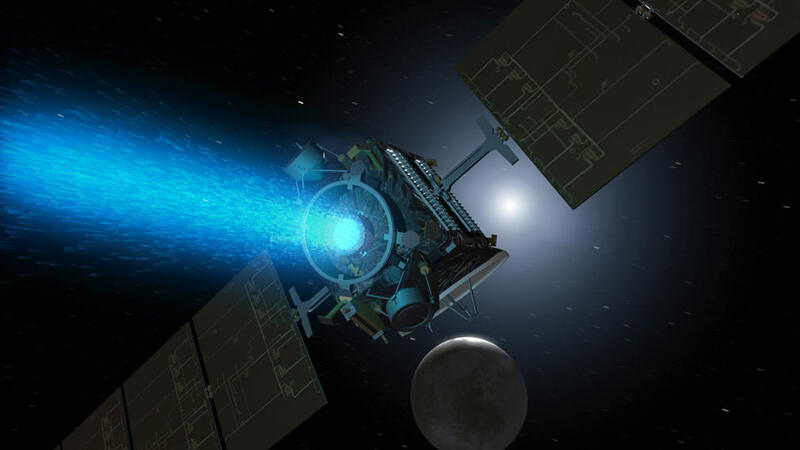 Second, the reaction that drives the spacecraft requires that the energy released vastly exceed the energy used to trigger the reaction. And while experiments here on Earth have surpassed the “break-even goal”, we are still a long way away from the kinds of energy needed to power an interstellar spaceship. 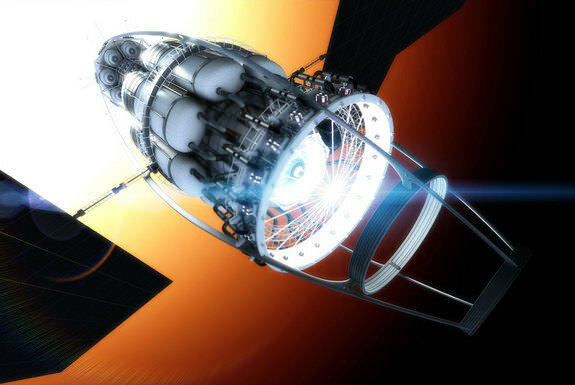 In short, a fusion rocket would not only be prohibitively expensive to build, it would require a level of fusion reactor technology that is currently beyond our means. Icarus Interstellar, an international organization of volunteer citizen scientists (some of whom worked for NASA or the ESA) have since attempted to revitalize the concept with Project Icarus. Founded in 2009, the group hopes to make fusion propulsion (among other things) feasible by the near future. It is for this exact reason that NASA’s Institute for Advanced Concepts (NIAC) has investigated the technology as a possible means for future Mars missions. Unfortunately, when contemplating missions to nearby star systems, the amount if fuel needs to make the trip is multiplied exponentially, and the cost involved in producing it would be astronomical (no pun!). A possible way around this is to create a vessel that can create antimatter which it could then store as fuel. This concept, known as the Vacuum to Antimatter Rocket Interstellar Explorer System (VARIES), was proposed by Richard Obousy of Icarus Interstellar. Based on the idea of in-situ refueling, a VARIES ship would rely on large lasers (powered by enormous solar arrays) which would create particles of antimatter when fired at empty space. We have written many interesting articles about space travel here at Universe Today. Here’s Will We Ever Reach Another Star?, Warp Drives May Come With a Killer Downside, The Alcubierre Warp Drive, How Far Is A Light Year?, When Light Just Isn’t Fast Enough, When Will We Become Interstellar?, and Can We Travel Faster Than the Speed of Light? For more information, be sure to consult NASA’s pages on Propulsion Systems of the Future, and Is Warp Drive Real? And fans of interstellar travel should definitely check out Icarus Interstellar and the Tau Zero Foundation websites. Keep reaching for those stars! Excellent article, as usual. I’ll go out on a limb and sound like a wingnut. But what about theoretical aspects? We seem so hopelessly confined to conventional understandings of space travel, but I still wonder about the possibilities of interdimensional travel. Mathematics suggests the existence of a multi-dimensional universe. Could they be utilized to get from point a to point b in this dimension? What about alterations in space time, a-la black holes and worm holes? I understand gravity would prove a nasty foe to using these monsters, but is there still a possibility of creating one or finding one that could be used for human use? At least in our present understanding, we appear to have hit a wall in long distance space travel. Even if we utilize the above, even with suspended animation…our efforts would seem rather existential at best given that the round trip would return us to a home where we would not know anyone, where all our friends and family would long since have expired. It would seem we need to return to imagination in our theoretical constructs or resign ourselves to being confined to the solar system. David, I think reaching a black hole would take longer than it’d take to reach the star, so using one of those would be counter-productive? Unless we made our own temporarily, or something. As for the other theoretical things, for all we know now we could say we could get there before we even left using interdimensional/time travel. Nobody knows for sure, though, and this article just sticks to conventional methods we’ve got down (or theories with a definitive speed like nuclear pulse propulsion). Maybe one day traveling anywhere in the universe can happen in the blink of an eye with those other ideas! This article is cool, I love seeing answers to unorthodox questions like this. One thing I always think of, though, is how people tend to think we’ll pick up the whole human race and relocate them. But in the actual case of us inhabiting another planet, only a few people would really go (at least, that’s how we’d do it now). Taking more than a few vital people would be too much added weight and supplies and the mission would never work out! Hmm, not sure Nuclear Pulse would be a valid form of travel for us lowly humans. Wouldn’t the g force from such a pulse transform us into small piles of goo? Though for probes it would be nice. Also, how do theoretical antimatter engines stack up? If we can eventually find a way to produce the stuff in sufficient quantity, that may be able to get us there. so is that factor in , when you say it’ll take 85 years to arrive to our closest star? I believe they figured out the g force problem for Project Orion. Something about a shock absorber. Smart, imaginative people back then I suppose. What we really need to do is get ourselves a technology that will get us up near the speed of light. Then good old Lorentz contraction will shorten the distance we need to travel considerably… Hmmm – easier suggested than done, me thinks. I am sorry for the criticism, but unlike what told above, I think that this article is really of a exceptionally low quality, that I am surprised to see here on this blog. Not only it completely ignores that such long travel necessarily includes accelerating and decelerating phases (likely half of the journey each), it ignores maximal possible long-time acceleration and deceleration (which could not be much higher than 1G for human flights), but it also looks like the author completely misunderstood the principle of ion drive propulsion, and of gravitational assist. At ion propulsion (or any other similar one), the thrust results in acceleration force, and that again in the acceleration. You need to dimension the propulsion according to available power and propellant supplies, and the mass that needs to be accelerated (including the propellant). The time the propulsion is active plays a role too, of course (ideally it would be accelerating 1/2 way, and decelerating the other half). And of course, as already written, you are limited by the maximal acceleration (at human travels it could not be much more than 10m/s2, but also at robotic probes there would be limits). So basing the calculation on the constant maximal speed achieved by DS1 is a nonsense. You can scale it up (technologically no big issue) to get higher acceleration, and let it on much longer (both for the acceleration and the deceleration), but you are limited by the power supply and by the weight of the entire system (including propellant tanks). The calculation would be much more complex, but the result would be quite different from the one shown in this article. And as for the gravitational assist – you cannot use the Sun for assisting a space ship – the boost it gives the ship when it falls to the Sun, the vessel loses again when flying away. You can only use assist of planets that gravitationally pull the ship behind them, but that force is quite limited and not of a big interest for interstellar trips. You could only use pull of the Sun if you made huge spirals in the galactic space around the Solar system, using it relative speed to the galaxy center, but that would make the travel many times longer. I’ll propose a possible scenario. Lets say we develop, in the not too distant future, say a highly focused beam of energy that could be transmitted to our craft, or perhaps fission drive with a hydrogen scoop for fuel/thrust. The important thing is we have a craft that can accelerate/decelerate to proxima all the way there ( decelerating at 1g halfway there). So our craft (freighter) can carry a crew and supplies and can accelerate/decelerate at a constant 1g. How long would it take? As a matter of fact lets skip this first model and go straight to a second model which has the ability to accelerate/decelerate at up to 8g, but would only be used as a reasonably healthy crew could withstand for short periods, then 1g. The gravitational assist one stood out to me as wrong. You can get a boost from a planet, by a hyperbolic fly-by. You end up moving away from the planet with the same relative velocity you had on approach (with comparatively minor course adjustments if necessary). This gives a boost in velocity with respect to some other reference point, due to the motions of the planet. You effectively grab a little bit of momentum from the planet. That can’t work with the Sun. However, that’s impossible, because with 1g you would get close to the speed of light pretty soon, and there the relativistic laws apply, increasing the mass and decreasing the accelaeration. It would require a more complex formula to get the real time needed, but likely the journey would not be that long even with a more moderate acceleration rate (assuming sufficient energy for the propulsion is available during the entire flight). I did not see the numbers, so I do not know in what force and acceleration the nuclear explositions would result, but my very raw guess is that the absorber would need to be several miles long to allow for sufficient aborbtion. And that again would represent huge mass that needs to be accelerated, hence requiring much more additional energy. A planet that can support life will have life, and we will have zero immunity to it. It’s better to just send our genetic information so if there is intelligent life they can simulate us and perhaps send back some suggestions. Unless we discover a potentially life-sustaining planet about Alpha Centauri, I doubt we will attempt to send any spacecraft there until it can be done in less than 100 years — and that’s a long way off. I just don’t think there will be any incentive to invest in a multi-century mission unless there is some other factor involved, like a critical threat to our existence on Earth. As for a manned mission, I reckon 40 years (averaging 0.1c) will be the longest attempted. I believe that fast a ship is theoretically possible, but again we’re a long long way off. So for the next few decades at least, we are better pouring our resources into better and beefier telescopes to do long range surveys of the nearer solar systems. My guess is that before we set foot outside our own system, we will have a catalog of tens of thousands of exoplanets from which to choose from to visit first. Instead of trying to force the universe to act how we think it should act(something we do here on earth), the whole of science would benefit greatly by working with natures grain not against it. Nature has already figured everything out for us, we just need to learn how we can tap into the inherant knowlege in such a way that we join with it in a “natural”manner. The broader our perception becomes the more we need to keep in mind that all things interact. An infant has a narrow understanding of what it sees. As it learns that understanding spreads to include bits of information that previously were isolated and not related in perception. This concept can be true when compared to science as a whole, humanity has not put much energy into trying to blend all scientific disceplines together to create a GUT. Renniassance man= multi discepline learning= potential for great understanding. I know we have the ability, I know we do not yet have the focus or long sightedness it would take to achieve any great things, such as interstellar travel or world harmony. This article doesn’t suggest any of them are that logical, nor that we need to invest in it. Because obviously right now it’d take way too long to reach it. It was just food for thought, really. In regards to the life on another planet, there are 3 possibilities. Of course, when the time comes to study other life, we’ll assume that #3 to be what we’re dealing with, to prevent getting stuck in a worst-case scenario, #2 to be of slightly-less-but-still-great importance, and #1 to be how we hope it turns out. The way you spoke of it, you make it seem like you know 100% we’ll get destroyed by the life we find. Again, the article is using estimations to just give us a general idea. You guys are like ‘MAN SENDING A SHIP TO ANOTHER STAR NEXT YEAR WOULD BE DUMB.” Yeah, obviously. Todos alguna vez nos preguntamos cuÃ¡nto tiempo tomarÃ­a viajar a las estrellas y si ese viaje serÃ­a posible en el transcurso de la vida propia. Hay muchas respuestas para esta posibilidad, de las cuales algunas son muy simples y otras pertenecen al reino de la ciencia ficciÃ³n. […] Fuente: Ian O’Neill para Universe Today. Maybe I’m just dense, but you say Alpha Centauri is the dimmest, yet on the Hertzsprung – Russell diagram it’s by far the brightest (highest on the vertical luminosity scale) of all Centauri stars, second brightest on the whole diagram. The scale isn’t of apparent luminosity, is it? Oops.. I made a typo myself. The error I’m pointing out is that you say Alpha is the brightest, whereas the diagram puts Proxima/Beta Centauri as brightest star, brighter than even both Alpha Centauri A and B put together. Nevermind.. I found Proxima on the chart.. Nothing to do with “Beta” Centauri. I fancy the idea of a very long rail gun myself. Granted this would be a one way trip for a probe but I like the fact that a system of rings could be set in a line and a probe would pass through them. As the probe approaches the ring, the ring’s magnetic attraction increases around the probe drawing the two objects closer together then as the probe reaches the ring the Magnet is deactivated and the Probes inertia carries it onward. You might even reverse the polarity of both so that magnetic repulsion occurs inspiring an even greater boost to velocity. The More Rings you have placed in a straight line, the higher velocity you might potentially achieve and best of all, your ship needs not carry any sort of fuel except for navigational corrections. Considering you’re traveling at 5% the speed of light, would there be a slow-down in time for the passengers of the ship? In other words, would the trip be 85 years viewed by the people of Earth or would the trip seem to last 85 years for the people on board? Or would the time seem the same for both???? I’m a bit conservative as well when it comes to the point of “human” exploration. With so many technological advances in robotics I see no reason for putting anyone in harm’s way. Even though a pair of human eyes is always better in the observational sense the risk is just to great for that particular astro/cosmonaut and the space community as a whole can you imagine the moral problem we would face if someone were to die. There would’nt be another try for a 20 years or so. Actually, these figures would only be true if the Alpha Centauri system was stationary relative to the solar system. Radial velocity is 22 km/sec in approach and proper motion 5 km/sec – almost toward us. Can anyone do the trig and work out when Alpha Cent system will be closest to us and by how far? Then we could do the trip in much less time. As far as The time issue goes I believe it is relative. Anything accelerating away from the earth appears to slow down while anything accelerating toward the earth appears to be faster. This throws the whole idea of a maximum velocity out the window though and our scientists seem to be stuck on that idea. This also puts a kink in space travel in that we still have to aim our craft to intercept the object we are aiming for and its relative speed trajectory and now relative time difference into account. But to make a long story short it would seem like 80 years to the people on board but to the people of earth it will look like it takes at least the amount of time the light from that object takes to reach earth no matter what speed we reach. Oh and SUGARAT I agree completely and belive we should talk. I have been saying the same thing for years to all the people I know and wish more people would realize it. I’ve been wondering what the chances are of hitting a solid object between here and there (where ever “there” may be). How much stuff is out in the Oort Cloud? How about dust, debris and larger objects in interstellar space? Seems to me that a good strategy is to send a fleet of highly miniaturized (or even nano) robots with the understanding that there will be losses on the trip. Perhaps if they were smart machines they could join up at the destination and construct some sort of a transmitter to send information back to Earth. Even if we could travel close to the speed of light, surely this would be impractical. At, say, around 20,000 km/sec or faster, any subatomic particle would manifest itself as a highly enegetic cosmic ray particle with disastrous consequences. By 2020 we should know whether or not there would be habitable planets around Alpha Centauir A and B. They are both very close to what our star, the Sun is. Forget Proxima. It is too tiny, and way too much unlike our Sun for humans too survive. If we can discover other “Earth like planets” within 1 to 2 centuries of space travel using the Orion method, we should go for it. We are thinking too small and too short term. Also Proxima Centauri is doo-doo. For another .17 light years, you may as well go to Alpha and Beta. Too short term: witihin the next 50 years, we should have effective immortality for humans through medical advances. That changes all the rules about how long you can take to get there. Too small: don’t muck about with ships. Take a planet. Mars might be big enough. Either live underneath the surface or make an artificial sun. Plan B, consider taking the Sun and all the major planets. It can be done, it’s the space tug idea on a grand scale. Well, that’s enough mind boggling ideas for today. Remember, you heard it here first. Everyone needs to pause a bit and think about the motivation for the article. The article is a valid discussion of the distances and times it would take to travel to another star using diffenert technologies. Remember, around 200 years ago, a fast ship would take about 9 months to travel from England to Australia. Now it’s about day in a plane. I often wondered about this very question – so thank you to the author. The article didn’t assert to predict the future, only discussed the present times to open further discussion. It seems so simple at first – only four point something light years away – but we all know that is still a very long way. Currently, travel at, or remotely near, the speed of light is not realistic, so our fastest ‘feasible’ travel speed must be only a small fraction of light speed within the foreseeable future. There are obviously undiscovered ‘faster’ travel methods that we will hopefully discover in the near future, but others have decided to discuss the human challenges. I point to the technical, ethical and financial constraints that surround the present day discussions of travelling to the Moon or Mars to stress my point. One-way trips to Mars are contriversial enough, so I say again – thanks for the article; others needn’t loose sight of the original purpose of the article was to simply discuss the times it would take using present technology, and to give us laypeople some ‘perspective’. Therefore I suggest we should debate always, but not ovely slant the debate towards the technical challenges of humans travelling to the stars when the ‘walk in the park to Mars’ is proving difficult enough. I think our first step is to colonize the solar system, that will give us better experience in developing faster propulsion systems. I’d say at least 50 to 100 years from now will be a more realistic attempt to send a probe to the nearest star system. I hope its within our life time. Imagine travelling 80 to 1,000 years to the nearest star, and then finding out there is absolutely nothing of interest there. Fuel is gone, next nearest star is another 80 to 1,000 years away. It seems to me that for Humans and all the other alien species out there, we are all stuck in our own little solar systems. operated 3 dozen nuclear reactors in space for electricity production. At 1G it only takes a year to get to near c.
As for the nuclear-pulse Orion, the Test Ban Treaty simply didn’t allow exceptions for nuclear detonations in space that were clearly *not* weapons tests, so they had nowhere else to go with the concept. Imagine doing the best telescopic study from this solar system you can, first. And possibly sending robotic probes after that, befor committing people…just like here. And define ‘nothing of interest.’ Some people (sadly) don’t care what probes are doing on Mars at this moment. Along the lines of Marcellus regarding Proxima Cen as a viable destination for humans, the star ( a red dwarf) much less luminous than Sol, is classified as a ‘flare star’ (as are most magnetic dwarf stars) capable of producing flares intense enough to create copious amounts of X-rays (see Wiki listing for Proxima Cen for details). Alpha Cen A and-or B would seem more stable, luminous stars with a better likelihood of habitable planets (or moons orbiting gas giant planets). In any case, a great article on interstellar flight & great food for thought. Thank You Stanton, I was thinking about your work on the Nerva & Phoebus systems when I read this. We could learn a lot by just looking at all the fantastic space technology that was developed 50 years ago. MC, both ideas go kablooie. Space is a near vacuum anywhere you go, even in a nebulae. There are no meteor storms to watch out for in interstellar space. (Nothing to keep them together) It would be like watching out for meteorites while you are driving…not a major concern. The Milky way affects us here the same way it would outside our solar system. The heliopause affects atomic size particles, not spaceships. The Oort cloud is invisible mostly because “cloud” poorly defines it. It’s far more tenuous than whales in the ocean. How many times have you dived in to land on one’s back? I personally think it’s hilarious anyone is worried about radioactivity in space. It’s got to be a red herring or simply the worries of bureaucrats with little astro-education. There is a radioactive belt or two surrounding the earth even now. Space is filled with radioactivity. Nasty place. As described in one post, bomb detritus would spread to near nothingness in little time. It would probably take off from moon orbit anyway. Too big to launch from earth surface. And the blast absorbtion plate would have to be enormous? Where does that thinking come from? The blasts are smallish and continuous. It doesn’t have to be a Hiroshima every ten minutes. And whatever distance from the ship that works, doesn’t have to be just 15 metres away. I think anti-matter will probably be the answer that gets us there. Massive energy from smallest quantity, and lacking in need for extra-dimensional travel which will probably always remain a tantalizing theory at best. Within two or three decades, we should have sufficient molecular manufacturing technology to create extremely efficient, small, light and highly intelligent robots, as well as small nanofactories capable of creating any object from patterns stored in computer memory. Sending them out to the nearest stars would take far less energy than sending humans. If a robot arrived at a suitable exoplanet, it could use the nanofactory to construct a laser receiving station (or similar device), as well as living accommodations for humans. The same technology that would allow the construction of the robots and nanofactories should allow us to disassemble human beings and reassemble them. This may allow us to store entire humans as digital information. We could then beam the information to the receiving station on the exoplanet. The nanofactory would reassemble the human patterns, creating exact duplicates of the original human templates, and those humans would have living accommodations already waiting for them. Of course that would still take a while: probably hundreds or thousands of years to get the robots to the exoplanets, then at least a few years to establish a connection with Earth (beaming info at lightspeed), and then a few more years to beam the human patterns to the exoplanets. By that time we’ll likely have populated the entire solar system and probably won’t resemble modern humans in mind or body much at all. So…forget it. At least for now. Maybe some AI will come up with a way to shorten the trip, so just wait a few decades and find out. Thanks so much for the article and reader comments. Exciting visions. Always dreamt of such possibilities as a small boy. Unfortunately, nowadays, the negative consequences of global warming accelerate faster than the development of interstellar propulsion engines. Trying to be realistic, I only hope that there will be human astronauts after 2050 or so to board space ships. Maybe we could travel to other planets with our mind rather than our bodies. OOBE’s anyone? To: Peter K., While space is a near vacuum, I suspect there are chunks of unknown quantity and material within this near vacuum that can easily destroy a space vehicle. A couple of probes NASA has lost contact with over the years comes to mind. Another thought, for mankind to do any serious space traveling, it would be necessary to develop a means to exceed the speed of light several magnitudes. Attempting a trip to the Alpha C system, at just a fraction the speed of light, doesn’t make much sense. Maybe we need to learn to live on this planet before we go to another? Planet starbucks haha….drill for oil on planet exxon…kinda reminds me of several sci fi films where the lifeforms are called a disease or virus, they jump from planet to planet destroying each in the process and the only solution is to find another host. Did anyone mention suspension, cryonic or other? You miss the point of space travel. The trip between the stars is the interesting part. I would love nothing more than the chance to travel alone in a spaceship to another star, even knowing I would die of old age before making it to that star, just for the chance to be out there, every day, watching the stars from outside of Earth’s atmosphere, knowing I am that much closer to another star. If you have ever had the chance to look at stars through an actual telescope, not the internet pictures, taking the time to just look at some random name-unknown group of stars, it is fascinating. I am enthralled by the fact that I am looking at real suns live (minus light year distance of course). There is something about it that overwhelms. I am not one who would immediately plant a carbon copy of human society on another planet. What difference does it make what planet you watch TV on? It is the chance to leave this society behind and be out there with no one else except the stars that draws me like nothing else in life. Pick any one star, no matter how far, and head for it. Reaching it doesn’t matter, the chance to be out there does. well for the G forge thingy you can be put in a room filled with some sort of material that dampens the effect of the inertial forces… or some sort. easy to be done, and there are some results in achieving this kind of material, for example Asics (shoe manufacturing) uses some kind of rubber on which u can drop an egg from 3-5 meters and it won’t break (the layer was just 1-2″ thick). so it can be done the means of propulsion must be developed more. Intersting article. And even more interesting comments. Aside from the fact that you’ve neglected to mention beamed power, it’s okay. But I’m sure that 80 year figure can be improved. Perhaps by launching the nukes ahead of the starcraft, or maybe by some other means. Agreed. Although I’d quite like to have someone with me on the Starcraft. We could always build a massive coil gun, preferably orbiting one of the outer planets. Build it in an elliptical shape, like a particle accelerator, accelerate a small craft to the maximum % of c we can get from storing power from nuclear generators and solar power in superconducting capacitors and then let it fly, using nuclear pulse propulsion or some other form of propulsion for additional thrust. Realistically, we can get a lot higher speeds and lower mass crafts by using robotics rather than manned voyages. This method reduces the problem of on-board fuel. It all depends on how much power we can store, and what velocity we can accelerate the projectile to. I suggested the coil gun over at NewMars. The unfortunate thing about it is how long it takes to get up to speed without killing its occupents and such. So I suggested launching Ion beams instead. Others suggested Aluminum pellets. Those could work to, if they could perhaps be vaporised to form high speed Ions hitting the craft. Decelerate at the target system using a combination of MagSail and Orion. Aim for a top speed of say maybe 25% of c, although I’m fine with 5% (extended lifespan, remember), But 20 years to Alpha Centauri would be good. Although I’d trade it in for 50 years to Tau Ceti or Epsilon Eridani (much more promising places). I’m going to look at Interstellar travel a little differently. From a mission perspective and not from a propulsion perspective. Let’s look at our goals: To find a habitable planet our race could call home. Optics make it impossible for us to see what the planet actually has to offer us as far as living conditions goes. 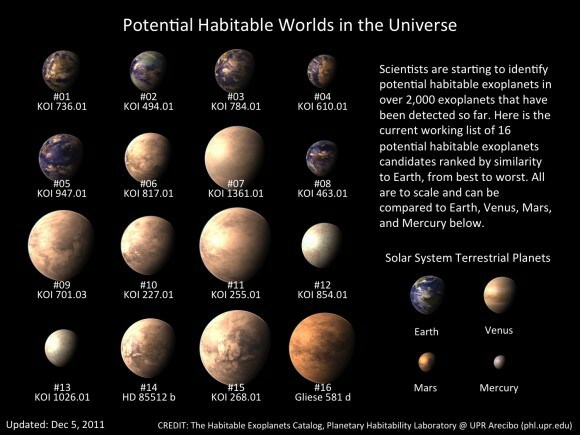 Is the planet habitable? I think the first mission(s) around our local star group should be of the flyby variety. Gaining speed from day one and slowing down only after half our local group is visited for the return home. We may only be in a solar system for a few productive days, but we would gain more information about planets in that system than any kind of optical examination from Earth (or Earth orbit). This kind of mission reduces the cost of slowing up for each system and decreases the time it takes to examine all the local stars near us. We could send a burst signal with data if a system is suitable for human life as the mission progresses. This type of trip will most likely be a generational trip. But it also has the advantage of being able to be aborted if we find out we can actually move faster than light at some future time. And if the scientists and engineers get smarter over generations, who knows. Maybe this generational attempt to explore the stars comes up with the way to go faster than the speed of light while we on Earth are stuck with methods that still can’t get faster than 20% of light speed.